49 y/o M with hx of HTN, HLD, IDDM presents with non-traumatic L-sided painless visual loss. The patient states that several hours prior to presentation he developed blurry vision in his L eye. On quick examination, there are no signs of trauma. Visual acuity is 20/120 on the L and 20/40 on the R with normal intraocular pressures bilaterally. Pupils are briskly reactive without any photophobia or consensual photophobia. The lids, sclera, conjunctivae are grossly normal and there are no corneal defects with fluorescein staining. Coming out of the room, you are concerned about this sudden-onset blurry vision. You remember a short lecture on visual acuity changes that Dr. Schindlebeck begrudgingly gave you in between his posting about sweater vests on Pinterest. 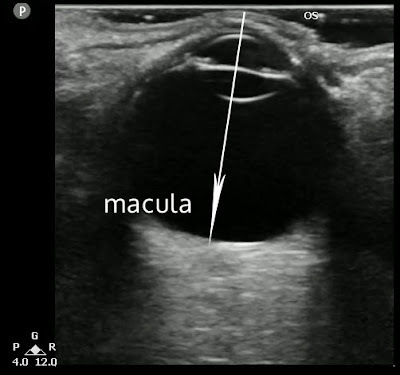 Your differential brings concerning diagnoses including central retinal arterial occlusion (CRAO), central retinal vein occlusion (CRVO), retinal detachment, as well as vitreous hemorrhage. Now, our patient still has some visual acuity in the affected eye which speaks against CRAO (usually profound loss of visual acuity…unable to count fingers, etc.). CRVO is certainly on the differential, but it is usually not a time-sensitive diagnosis to make. That leaves us with retinal detachment vs vitreous hemorrhage. Might be a nice time to CONSIDER THE PROBE! 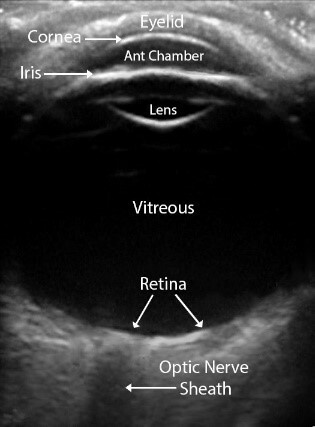 Noting the echogenic (hyperechoic) snake-like structure floating in the vitreous that ORIGINATES from the optic nerve (the optic nerve sheath is the hypoechoic “band” passing posteriorly from the vitreous chamber, see image above for anatomy review)—you are appropriately concerned that your patient may have a retinal detachment and needs urgent ophthalmologic consultation and you put a page out to the on-call resident. You note more globular hyperechoic material that swirls with kinetic maneuvers. There is no “connection” to where the optic nerve originates. Thus, you are less concerned for a retinal detachment and are moving towards a less time-sensitive diagnosis of vitreous hemorrhage. Recognize that sometimes these hemorrhages can be subtle and may require you to adjust your gain (“lighten” your image) to visualize the abnormality. While you still want to provide your patient with a prompt ophthalmology f/u appointment, you recognize that you probably don’t need to page the on-call consultant at 3:30 in the morning for a patient with these findings. 1) Retinal Detachments appear as a snake-like hyperechoic extension floating in the vitreous that should “originate” from the optic nerve. 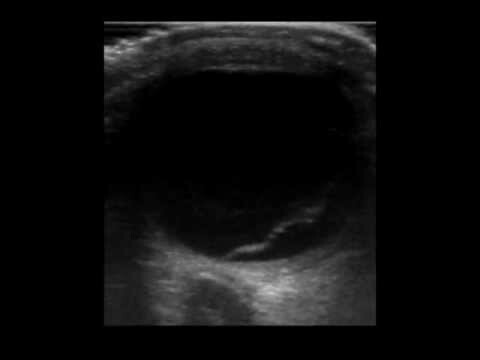 2) Vitreous hemorrhage appears as less well-defined hyperechoic “globular” debris in the posterior chamber. It may be subtle and you may have to adjust the gain to visualize it. 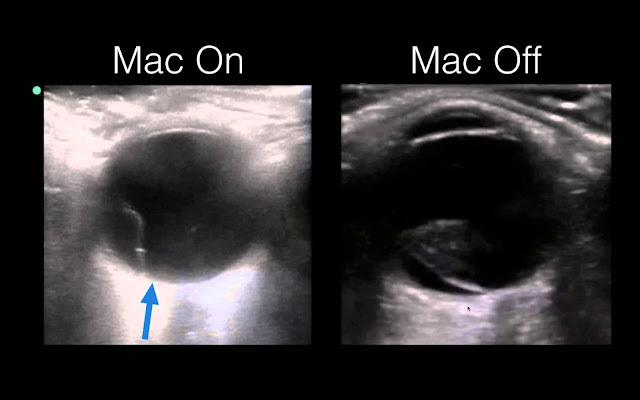 3) Retinal detachments that preserve the macula “Mac- On” require EMERGENT ophthalmologic consultation, while “Mac-Off” detachments are URGENT, but non-EMERGENT. Consider the Probe 3: So I've found the effusion, now what? Weekly Fix - Gallbladder: Take Two! County Rush Clinical Ultrasound. Simple theme. Powered by Blogger.